Plastic Recycling Equipment (for dental floss)(customized) - Sinchung(Jachen) Technology Co., Ltd. Plastic recycling equipment includes the conveyors, crushing machines (granulators), the blowers (fans), and the cyclones. When you have many raw materials to scrap, you should put them on the conveyor. And the conveyor will bring the raw materials up to the crushing machines (granulators). It will save a lot of manpower. The blower draws the scraps from the crusher machines to cyclone. Then scraps are saved in the cyclone. The model sprcialized in crushing dental floss. It can separate the plastic and cotton floss. 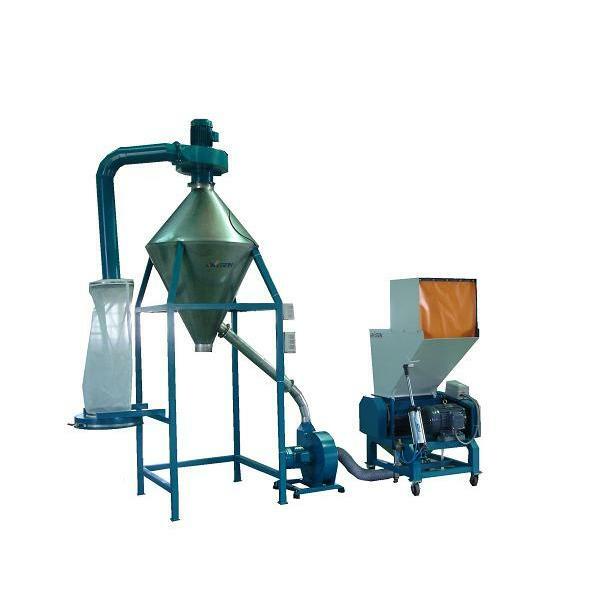 We can accord with the client` s requirements to match suitable crusher machines (granulators). The crushing and the recycling flow automate completely. Our plastic recycle equipment can work efficiency promotion. Our plastic recycle equipment has a higher quality and the output. It`s easy to clean our equipment more convenience and save time.